Every Thanksgiving the United States bustles with people preparing extensive and intricate menus designed to delight and astonish their friends and family. They spend thousands of dollars on the equipment and groceries to pull off one single meal (which, hopefully, people will write songs about and speak so highly of it becomes the stuff of legend) that comes together so perfectly it was like a dream. Many of the things that go into a Thanksgiving meal are made by baking and roasting; from delicious pies to sweet potato casserole, to the glorious turkey itself. The oven is king during this holiday! The first step to pulling off this marvelous meal, is to know and understand baking and roasting and how they are different. The last thing you want (again, if your end goal is the lore of your awesomess) is to accidentally bake your turkey and end up with a slightly off finished product. The differences between the two methods are subtle, but worth understanding. Let’s go! What is baking? What is roasting? Baking is a dry-heat method of cooking that is done by placing your food on (or in) a surface (like a sheet pan or a 9×13 dish) and cooking it in the oven. More often than not, when we think of baking we think of sweets – tasty tarts, cakes, and brownies – but baking is not reserved just for the sweet. The term baking when referring to savory foods is usually reserved for breads, fish, and vegetables but is also wonderful for casseroles and appetizers. Roasting is a dry-heat method of cooking that is done by elevating your food on a rack and cooking it in the oven Roasting is often reserved for things that are solid – like vegetables and cuts of meat, as compared to baking which can start loose and become solid in the baking process. I do want to clarify something. Many recipes may tell you to cover your 9×13 dish with aluminum foil and bake it in the oven – they are deceiving you. Baking and roasting are both dry-heat cooking methods – which means they do not rely on water to help them cook. When you are baking and roasting you want evaporation of moisture, but when you cover a dish with foil, you are trapping in the moisture causing the food to steam or braise instead. I don’t know about you, but the first time I learned that, it was a little bit like when saw Grease for the first time as an adult – it definitely wasn’t what I thought it was. The results of mixing up these two methods isn’t detrimental to your meal coming out well. In fact, knowing the difference mostly just gives you a sense of superiority over others for having a greater knowledge of cooking. Here are a few things anyway that are good examples of why knowing the difference matters. Your Money. I’m going to let you in on a secret – restaurants LOVE to use baking and roasting interchangeably on their menus because using certain buzzwords mean they can charge you more. For example, if I were to tell you I was selling you roasted vegetables, that sounds more appetizing than baked vegetables, right? Baked vegetables gives me the mental image of something that is squishy, mushy, and slightly discolored…but if I tell you I’m selling you roasted vegetables, the mental image is of something that is beautifully caramelized and rich with flavor – therefore, I can charge you an extra $1.50. Here’s the catch – most likely those vegetables really are being baked, because they are being cooked on a sheet pan and not on a roasting rack. “Is that really a big deal?”, you ask. Go try my oven fries by baking them on a sheet pan and decide for yourself if the results are worth an extra $1.50? Your Showpiece. 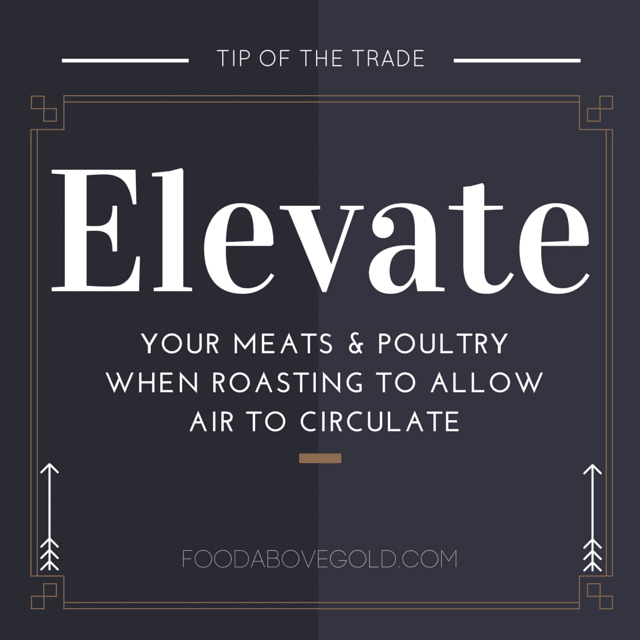 Knowing the difference means that when you go to make that super awesome Thanksgiving meal, you are wise enough to make sure that even if you don’t have a roasting rack, you are going to go out and get one to make sure that air circulates all the way around that turkey. You don’t want someone to pick up that drumstick and it have a beautiful golden crust on top and be soggy and blanched underneath from sitting in its own juices, right? That is not part of your Thanksgiving saga. Your Sauce. When your turkey sits in its own juices and drippings, it don’t get the same opportunity to develop the rich and caramelized flavor that you will use as the base for your gravy or jus. Also, the fat to juices ratio will vary between baking and roasting, so the flavor and texture of your sauce will vary between the two. Your Sanity. This is an annoying topic that a lot of people like to quibble over. Whether you decide it is semantics between the two methods, or you just like to be precise, knowing what makes baking and roasting different gives you a head-start to winning that conversation next time it comes up. Or better yet, it keeps you from wasting your time and energy on recipe that calls for the shrimp to be roasted when it should be baked, or for the chicken to be baked when it should be roasted. You’ll now be able to look at that recipe and say – “A-ha! I WIN, poorly written recipe!”, and solve the problem before it arises. I hope that lesson on baking and roasting has helped answer any lingering questions you may have had about what sets the two apart from each other. If not, let me know and I’ll be happy to answer them the best I can. While you’re at it, tell me a story of a time when a recipe told you to bake when you should have roasted or vice versa and what happened to it.